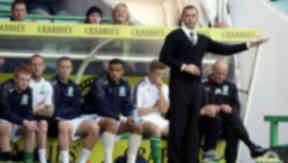 After a confidence-boosting 5-0 win against Berwick, Hibernian’s manager is ready for the Edinburgh derby. Hibernian boss Colin Calderwood has reflected on his side’s Scottish Communities League Cup win against Berwick and said that although he was impressed, his players must now carry form into the league. Goals from Martin Scott (2), Akpo Sodje, Garry O’Connor and Ivan Sproule gave the Easter Rpoad outfit a comfortable win over Third Division Berwick and Calderwood said that he could not have asked for more. “It was as impressive as you would want against a team from a lower division,” he said. “They deserved the scoreline." However, with a Scottish Premier League match against city rivals Hearts coming next, the manager said that it was time for his side to get more points on the board. Having lost three of their four matches in the league this season, most recently at home to St Mirren, Calderwood said he was hoping to see a response. "It's a different proposition," said Calderwood. "But we've really got to go to work in terms of league points. "We want to go and win and that will right a few of the wrongs from last weekend." The manager also said he was excited by form O’Connor had shown so far this season, scoring in four consecutive matches. "He's delighted to be here,” Calderwood added. “It was another good goal, but an even better performance. "The best thing for him is to be playing games, not be a sub elsewhere. "There's a lot more to come and there's a lot more we can give him in terms of service."